Barcelona, 1945—just after the war, a great world city lies in shadow, nursing its wounds, and a boy named Daniel awakes on his eleventh birthday to find that he can no longer remember his mother’s face. To console his only child, Daniel’s widowed father, an antiquarian book dealer, initiates him into the secret of the Cemetery of Forgotten Books, a library tended by Barcelona’s guild of rare-book dealers as a repository for books forgotten by the world, waiting for someone who will care about them again. Daniel’s father coaxes him to choose a volume from the spiraling labyrinth of shelves, one that, it is said, will have a special meaning for him. And Daniel so loves the novel he selects, The Shadow of the Wind by one Julian Carax, that he sets out to find the rest of Carax’s work. To his shock, he discovers that someone has been systematically destroying every copy of every book this author has written. In fact, he may have the last one in existence. Before Daniel knows it his seemingly innocent quest has opened a door into one of Barcelona’s darkest secrets, an epic story of murder, magic, madness and doomed love. And before long he realizes that if he doesn’t find out the truth about Julian Carax, he and those closest to him will suffer horribly. Reading this story has definitely changed my life. I was lucky enough to finish this book while staying in Barcelona, Spain. The way that Zafon describes everything is so magical in all of its attention to detail interwoven with beauty. This is definitely the type of book that can keep your nose stuck in a book for hours; it's so atmospheric! The narrator was wonderful as well, and the music that is added in the background made this listening experience all the better! Book is ok. It’s not bad by any means, just not as much “thriller” as I was looking for. It’s more of a generally interesting, VERY long winded, story. The narrator is the best part of the book. A very good book, complex but ensures to keep your attention. The first book I have been able to get my husband to listen to. I had never heard of Carlos Ruiz Zafon when I started listening to this book. 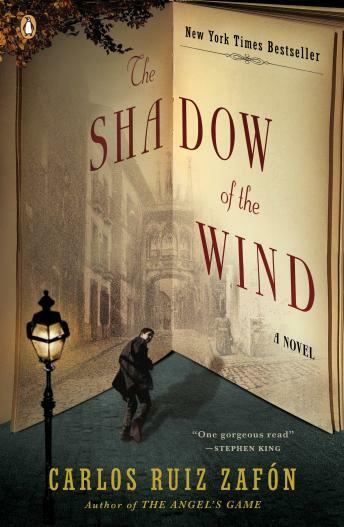 Suddenly, I was enthralled by a story full of vivid characters, a dark mystery, 1920s and 1940s Barcelona and Paris, a library of forgotten books, and many layers of story. It quickly became one of my all-time favorite audiobooks. Many thanks to Jonathan Davis for his wonderful reading. And the music that interweaves the parts of the story is beautiful, too. I loved this story, despite some of its flaws. The plot is a tad melodramatic and complicated. It includes several stories within stories, with some not-so-subtle parallels. Still, it kept my attention all the way through, so much so, that I missed it when I couldn't get back to it for a day or two. The best part might just be the narrator, Jonathan Davis, who really brought the tale to life. I didn't know his name, as I do some of the prominent actors who read other books, but thus far he is absolutely the BEST I've heard. His different voices were effective, but not over the top, and his Spanish accent is superb. (I wonder if it might be his first language?) Anyway, try it; you'll like it! I was a bit hesitant to get this book due to the very bad review it had gotten from another reader. But I LOVED it. So many twists and turns and you really get to know and care about each character in the book. Highly recommend this read/listen! I found this book to be very intriguing. There are books within the book. I enjoyed the story to the end. Also enjoyed the narrator; Jonathan Davis has a wonderful voice. This book left me cold. I found it difficult to follow, the characters too numerous and undifferentiated from one another. The narrator did not keep my interest. Overall, a big disappointment. In fact, when I returned the book after listening for six hours, I was not aware that the book came in two parts. Imagine my dismay when I received a second package of CDs! Who knows when I will receive the next book on my list. I feel like a whole month's worth of rental fee was wasted. this is the book that turned me on to Audio books. I would sit in the car to listen after my commute was over. I laughed, I cried. Its a "page-turner" in a creative, fantasy sort of way. Always another plot twist. Just a lot of fun was this book. I never considered total immersion into postwar Barcelona as a trip I'd be happy to take, but Zafon has clearly ammended my thinking. This book is a wonderfully rich, detailed story of a boy's quest to find truth. It meanders thru dark streets and years of discovery. The story at times almost appears haphazard and disjointed, but it really comes together marvelously. At it's heart, S of the W is a whodunit love story that weaves a remarkable puzzle that holds the readers attention until the very last revelation. The narraration is absolutely superb.